This article is about mythological ages. For the “Seven Ages of Man” speech from Shakespeare’s “As You Like It”, see All the world’s a stage. The Ages of Man are the stages of human existence on the Earth according to Greek mythology. 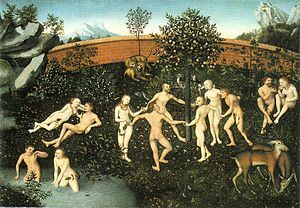 Two classical authors (Hesiod and Ovid) in particular offer accounts of the successive ages of mankind, which tend to progress from an original, long-gone age in which humans enjoyed a nearly divine existence to the current age of the writer, in which humans are beset by innumerable pains and evils. In the two accounts that survive from ancient Greece and Rome, this degradation of the human condition over time is indicated symbolically with metals of successively decreasing value. Golden Age – The Golden Age is the only age that falls within the rule of Cronus. Molded out of the earth through the hands of Prometheus, these humans were said to live among the gods, and freely mingled with them. Peace and harmony prevailed during this age. Humans did not have to work to feed themselves, for the earth provided food in abundance. They lived to a very old age but with a youthful appearance and eventually died peacefully. Their spirits live on as “guardians”. Plato in Cratylus (397 e) recounts the golden race of men who came first. He clarifies that Hesiod did not mean men literally made of gold, but good and noble. He describes these men as daemons upon the earth. Since δαίμονες (daimones) is derived from δαήμονες (daēmones, meaning knowing or wise), they are beneficent, preventing ills, and guardians of mortals. Silver Age – The Silver Age and every age that follows fall within the rule of Cronus’ successor and son, Zeus. Zeus created these humans out of the ash tree. Men in the Silver age lived for one hundred years under the dominion of their mothers. They lived only a short time as grown adults, and spent that time in strife with one another. During this Age men refused to worship the gods and Zeus destroyed them for their impiety. After death, humans of this age became “blessed spirits” of the underworld. Bronze Age – Men of the Bronze Age were hardened and tough, as war was their purpose and passion. Not only were their arms and tools forged of bronze, but so were their very homes. The men of this Age were undone by their own violent ways and left no named spirits; instead, they dwell in the “dank house of Hades“. This Age came to an end with the flood of Deucalion. Heroic Age – The Heroic Age is the one age that does not correspond with any metal. It is also the only age that improves upon the age it follows. These humans were created from the bones of the earth (stones) through the actions of Deucalion and Pyrrha. In this period men lived with noble demigods and heroes. It was the heroes of this Age who fought at Thebes and Troy. This race of humans died and went to Elysium. 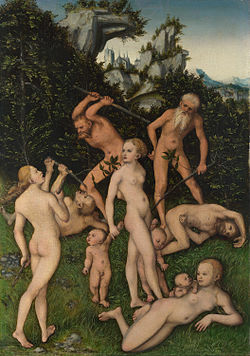 The Roman poet Ovid (1st century BC – 1st century AD) tells a similar myth of Four Ages in Book 1.89–150 of the Metamorphoses. His account is similar to Hesiod’s with the exception that he omits the Heroic Age. Ovid emphasizes the justice and peace that defined the Golden Age. He adds that in this age, men did not yet know the art of navigation and therefore did not explore the larger world. In the Silver Age, Jupiter introduces the seasons and men consequentially learn the art of agriculture and architecture. 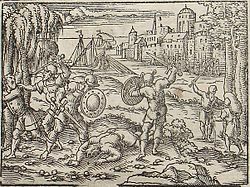 In the Bronze Age, Ovid writes, men were prone to warfare, but not impiety. Finally, in the Iron Age, men demarcate nations with boundaries; they learn the arts of navigation and mining; they are warlike, greedy and impious. Truth, modesty and loyalty are nowhere to be found. These mythological ages are sometimes associated with historical timelines. In the chronology of Saint Jerome the Golden Age lasts ca. 1710 to 1674 BC, the Silver Age 1674 to 1628 BC, the Bronze Age 1628 to 1472 BC, the Heroic Age 1460 to 1103 BC, while Hesiod’s Iron Age was considered as still ongoing by Saint Jerome in the 4th century AD. The Aztec tradition of Five Suns also involves four previous ages. The term Five Suns in the context of creation myths, describes the doctrine of the Aztec and other Nahua peoples, supported amply by ancient texts and calendars, in which the present world was preceded by four other cycles of creation and destruction. It is primarily derived from the mythological, cosmological and eschatological beliefs and traditions of earlier cultures from central Mexico and the Mesoamerican region in general. The Late Postclassic Aztec society inherited many traditions concerning Mesoamerican creation accounts, while, however; modifying some aspects and supplying novel interpretations of their own. The Hindu and Vedic writings also make reference to four ages (Yuga) termed: Satya, Treta, Dwapara and Kali. According to the Laws of Manu these four ages total 4.32 million years. These four yugas make up a Maha Yuga, a Chatur Yuga, or a Divya Yuga. 1000 Maha Yugas taken together equals one day of Brahma or 4.32 billion years. Brahma’s night is of an equal length which is also 4.32 billion years. Taken together Brahma’s day and night are 8.64 billion years in total. Brahma lives for 36,000 “Brahma days” so his lifespan is equivalent to 311 trillion, 40 billion years. After his death there is an equivalent period of 311 trillion, 40 billion years when the Universe is unmanifest. Then a new Brahma is born and the cycle starts all over again. Taken together the life and the death of Brahma equals 622 trillion, 80 billion years. This equals one cycle out of innumerable cycles in the Vedic Universe. ^ St. Jerome. “St. Jerome, Chronicle (2004-5). Preface of Jerome; Preface of Eusebius”. Tertullian.org. Retrieved 2012-11-16.